Breathable lenses for the health of your eyes. Without enough oxygen, you might experience symptoms such as end-of-day discomfort, irritation, dryness and redness. In the long run, lack of oxygen may even cause complications. 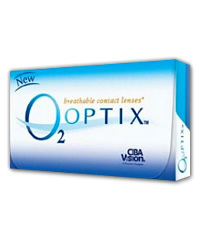 O2OPTIX is made with a revolutionary silicone hydrogel technology that transmits up to 5 times more oxygen than traditional soft contact lenses. Do your eyes look red and irritated? Do you usually have to take your contact lenses out before you wanted to? Something is about to change the way you look at contact lenses. It's O2OPTIX, the breathable contact lens that transmits up to 5 times more oxygen than traditional (HEMA-based) soft contact lenses - for whiter, healthy-looking eyes, no matter how long you wear your lenses each day. They're so breathable, you can nap in them or even sleep in them for up to 6 nights extended wear. Your eyes need oxygen to stay healthy and comfortable. But soft contact lenses create a barrier to the natural flow of oxygen between your eyes and the air around them. With up to 5 times more oxygen than traditional soft contact lenses, O2OPTIX helps to keep eyes whiter and healthy-looking. Order Now!